Crown Industrial Corporation was originally founded as a contract manufacturer in Cortland, NY, serving as the manufacturing, warehousing, and distribution arm for other companies. Crown Industrial is still actively producing various products for clients who provide the design, engineering, and marketing for their products. Production planning, efficient manufacturing, and inventory management is our core business, and by managing the manufacturing process, we allow our customers to focus on being innovative and providing the best service and support for their customers. The majority of Crown Industrial’s employees came from a background in manufacturing power transmission chain. So with the knowledge, experience, and equipment already in place, adding this product line was a natural evolution for the company. 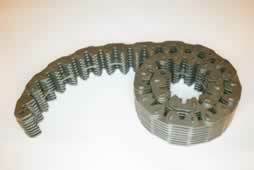 The company started its chain production by focusing on becoming a premier silent chain manufacturer. 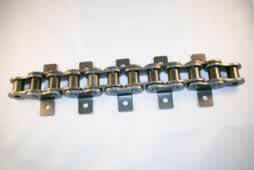 Custom attachment chain assembly was also quickly added to the Crown Industrial product line. To complete our chain product portfolio, we partnered with a large chain manufacturer to add roller chain, leaf chain, and other industry standard products to our offerings. We support those products with our customer service, testing, inspection, and warehousing capabilities just like we do for our silent chain line. We sell all of our chain products direct from the factory to end users, distributers, and equipment manufacturers. This gives you one place to get pricing, delivery, and technical support. We are currently developing a nationwide network of independent sales representatives to give our customers an additional, local resource for information and product support. Our sales representatives provide an additional level of support, but they don’t replace our customer support team. You still retain the convenience of being able to call or e-mail the factory directly at any time for that direct connection. Contract manufacturing is still an important and growing part of our business. Crown Industrial’s contract manufacturing division uses two different paths to the same end result. If you have an existing production process, we can transition the process in its entirety to our factory, including key equipment, existing inventory, drawings, procedures, and possibly even employees. Our focus on efficiency, quality and continuous improvement can yield process improvements and cost savings, even with mature operations. Our second contract manufacturing model is for new operations. We can work with you to understand your product and setup a new production process tailored to your products. Our extensive manufacturing background gives us global connections for equipment, raw materials, and tooling. And with a single location for all of our staff and operations, you get local, personalized service.